As ever, it’s not all about us, and we are focused on raising money for our chosen charity of the year The Community Sports Foundation #buildthenest. 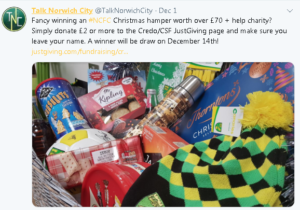 CSF have been kind enough to donate a load of Norwich City goodies for the hamper including a signed ball, mug, hat, flask, apron, pegs and sticker book. So to enter the competition all we ask is for you to donate £2 or more to our Just Giving page and tell us who you are! We will then make the draw on the 14th December and announce our winner! Jack Reeve from Talk Norwich City has been tweeting about our competition, so get in quick and get your name in that draw. So to be in for the chance of winning, you know what to do! 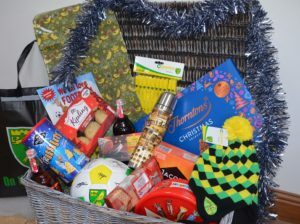 *The hamper is not included in the prize, only the contents and you must be able to pick up the prize from a location in Norwich.